You’ve viewed the YouTube videos, read about the TED experience and wondered if you would ever have the chance to experience TED live, in all its glory. Well, (drum roll) now you sort of do! 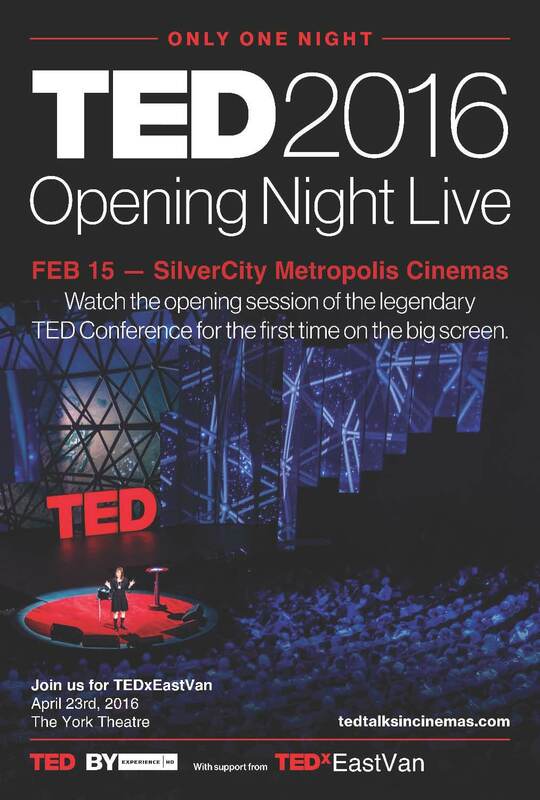 Don’t miss opportunity to view the opening night of TED 2016 LIVE for one night only at Silvercity Metropolis theatre on February 15th. The theme for this year’s TED is ‘Dream’. It will be a look at humanity’s toughest challenges, to listen to our greatest thinkers, artists and storytellers. Speakers include composer/musician AR Rahman and writer and producer Shonda Rhimes amongst other inspiring and creative thinkers. At just $20 a pop, you’d best book your tickets now. See you there!